I would like to have a tongue jack block that is light, strong (2000# TW), and at least 10" tall. I need the height so that I can raise my tongue/coupler pretty high to make it easier to "unload" my weight distribution bars on my Blue Ox BXW2000 Weight Distribution Hitch. I know I can stack the yellow blocks, and this is probably the less costly approach. It would be nice to have a single dedicated unit that I can use at home when stored and at campground. I have made one of wood (10" tall) but it was much heavier than the yellow plastic ones even stacked to reach 10" tall. I can always make another one out of wood if it appears that this may be the best solution. Not quite 10", but there's this Valterra one. If going tall, the wider you can make the base, the more stable it will be. I don't think you can buy ones with a wider base though. It may be an option....just need to verify it will fit my Bulldog electric tongue jack. Undecided if I should use something like this or the plastic risers??? There are other sizes available. The plastic blocks take up a lot of room. Looks like I may go with this one....10000# capacity is quite a bit. 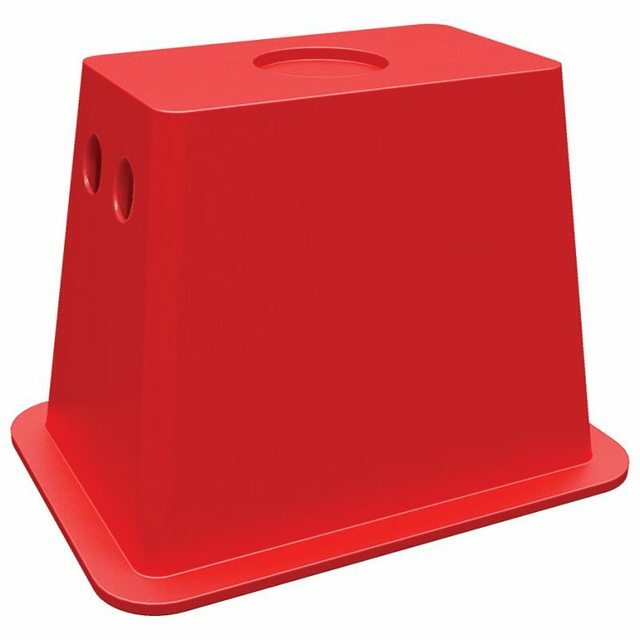 I bought one of those Valtera traffic cone jack stand supports. It's made for the bare end of the tongue jack. I put a metal skid plate on my jack and just use stacked 4x4s when connecting and disconnecting my TT to my TV. I just don't feel safe enough to use the cone to lift the front of the TT and the rear of the TV. It's a lot of weight. Plus I'm doing it in a truck pull off if heading north as I drag the TT rear pulling out my driveway before installing the WD bars. Going south, I loop through the high school bus lane for installation. One thing to consider about the "thing" (!) extension is how much it would hang under the tongue, IF you leave it on the jack!!! Back of tow veh goes down in a driveway entrance or ditch in the woods, so does the tongue of trailer!! No problem if removed until needed, but another step in the hookup/unhook procedure.